Latin is a course that I sort of stumbled onto in my search for high school electives. While perusing a magazine I saw an ad that sparked my thoughts in the direction of Latin as an elective for Chloe. When I was in high school Latin was offered as a foreign language and was typically taken by those who were considering a career in the medical field as many medical terms are based in Latin. Given that Chloe is considering a job in the medical field I thought choosing Latin as a high school elective might be the way to go. I think this could serve as a great way to show a foreign language in high school (which is not required for homeschoolers here in NY), but colleges like to see at least 2 years of a foreign language. Two other advantages that I see are, learning Latin roots can greatly improve vocabulary comprehension in preparation for taking SATs and Latin could be useful if she pursues a career in the medical field. This will be at least a full 1 credit/year course and could continue as more if Chloe wants to pursue a more in-depth study into Latin. Latin for Children was recommended to me as a very solid program. It is geared towards elementary aged students but I have read many reviews that say this is still a challenging enough program to start out with older students. This review of Latin Alive makes me think we should start with Latin for Children. Then if we like it and want to continue we could move in to Latin Alive which is done by the same company as Latin for Children only it is geared towards older students and moves at a faster pace. Getting Started with Latin: Beginning Latin for Homeschoolers and Self-Taught Students of Any Age There are a couple of things that I like about this book. One the price is right, at $9.99 for the Kindle edition, and with all the free audio located at GettingStartedWithLatin, it is a very affordable option. Plus, The Amazon rating for it is very high as well. My only real concerns are these: First that it won’t be a comprehensive enough program. The second concern I have is that not knowing Latin or how to go about teaching it, it is hard to know if this will be “correct” in its methods. Then again, I won’t really know that about any of the programs! Vocabulary Vine is the final option on my list. I plan on starting with this program. 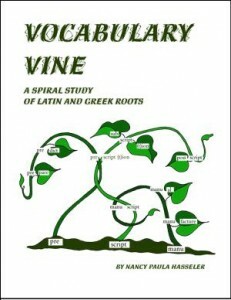 It is not a speech and grammar program, but instead focuses on just roots (both Latin and Greek). According to Samuel C. Brownstein, “Learning 50 key word parts can help unlock the meaning of over 100,000 words!” (from How to Prepare for SAT I 19 Edition, Barron’s Educational Series Inc., 1997 pg. 230) Therefore beginning with this method of study offers a good preparation for taking the SAT. One other thing I love about this option is the way it uses note cards. Learning to use note cards efficiently was a life saver to me in college. Vocabulary Vine does a great job of helping the student lay out note cards for each of the roots being learned, as well as gives them a filing system for them. Thank you so much for sharing Vocabulary Can Be Fun with me! It will most definitely be added to our resource list for Latin! You are most welcome! They have lots of goodies on their site.